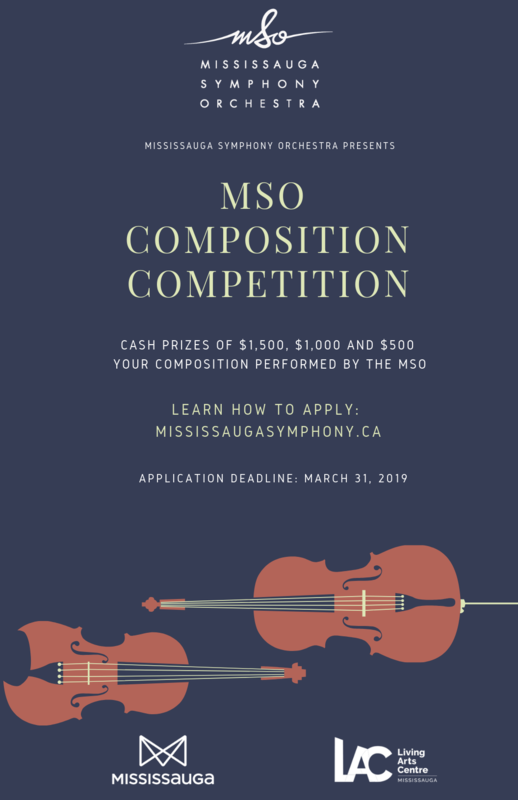 The Mississauga Symphony Orchestra has launched its first competition aimed at local composers! The competition will award three cash prizes and the opportunity for the winning composition to be performed live by the orchestra during the 2019/2020 season! This exciting opportunity is available to all Mississauga based composers who are interested in participating. There is no age restriction. A sample of past works. PDF score is ideal, but recordings are allowed. One page written concept of the proposed new composition using the guidelines listed below. Work should be approximately 5 – 8 minutes. 2 flutes, 2 oboes, 2 clarinets, 2 bassoons, 4 french horns, 2 trumpets, 3 trombones, 1 tuba, timpani, standard percussion and strings. Slightly smaller or larger orchestration can be discussed. Selected finalists will write a work for the 2019/20 season. The work will be read by the MSO in the fall and performed at a later date. *the winning piece will be performed in the 2019/20 season. Submissions are to be emailed to: ryan.tobin@mississaugasymphony.ca.